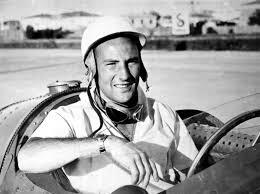 In terms of World Championships Stirling Moss may have been the perennial bridesmaid and never the bride – placing second from 1955 to 1958, behind Fangio for the first three of those years – but he did gain the honour of being the first British driver to win the British Grand Prix , when he came home first having started in pole position, beating the great Fangio by two-tenths of a second in a thrilling race where he overtook the brilliant Argentine on the last lap. Previously the race had been won by French, Swiss, Italian and Argentine drivers. Contrary to his usual preference, at the 1955 race, held at the Aintree track, Moss was driving a foreign car, in this case a Mercedes-Benz W-196 Monoposto – not a bad decision given the first four places were all taken by Mercedes drivers. This was a different era – not only has Aintree faded from the F1 scene long ago, but in 1955 drivers were still in some cases sharing drives (Moss himself went on to share the winning drive in the 1957 British Grand Prix, with Tony Brooks), and top drivers competed in more than just Formula 1 – Moss is reckoned to have averaged more than a race a week over his career, driving on the track and the road. And there was a minor controversy never likely to occur these days – Moss wondered for a time if Fangio had in fact let him win, though Fangio always denied it. In another era Moss would surely have won the championship, and is widely regarded as the best driver never to have been champion, his curse being to have raced in the same era as Fangio. This entry was posted in On this day;, Uncategorized. Bookmark the permalink.